The game begins at the designated start time when the coaches declares play ball (a 5 minute grace period is allowed if there are insufficient players to start). Both coaches should discuss if a game should be canceled due to inclement weather. The safety of the players must take priority and no game can continue if lightning is observed. A complete game consists of 5 innings or 2 hours for Junior, Intermediate. Time begins when the first ball is batted, no new inning shall start after one hour and forty five minutes. At least 3 complete innings must be played for the game to count for standings in the case of a rain out. There are no sitting players, all players play the game. Coaches must rotate players between the infield and outfield to allow development. Each player must play two innings on an infield position per game except where the player’s safety is an issue. The encroachment line is an imaginary line around home plate: at a 6 foot radius around home plate extending from first and third foul lines to the backstop. The dead ball line is an imaginary line between first and third base. The pitcher’s mound is located on the dead ball line between home and second base. On full size diamonds, the coaches must determine where the outfield starts before the game begins (generally 60’ radius around pitcher’s mound. Home teams supply the bases and game ball. Pitchers must wear face guard helmets. The catcher must wear full protective gear (mask, chest protector and shin guards). All players must use a suitable ball glove. Glove and bat size rules are modified from baseball rules to be reasonable in the circumstances, so as not to give either team an unfair advantage, as determined by the coaches. 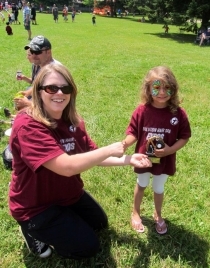 No scores will be kept for Junior and Intermediate T-Ball because all games end in a tie. Scores will be kept for senior T-Ball. Score should be verified after every half of the inning by either the scorekeeper or coaches, this is the time to correct mistakes that may have been made by either scorekeeper. If the scores have not been verified after each half of the innings and there is a discrepancy, then the home teams score will stand. There are 11 defensive positions – 6 infielders and 5 outfielders. A team must have a minimum of 8 players or the game will be forfeited. Pitcher must keep both feet on the mound until the ball is put into play. The pitcher may assist the catcher and is the only player other than the catcher able to cross the encroachment line on last batter. The infielders must be on the infield, positioned behind the dead ball line until the ball is put into play. Outfielders must maintain both feet in the outfield until the ball is hit. Players may not change defensive positions after they have taken the field and the first batter is in the batter’s box, except due to injury, illness or player safety. No player may play more than one inning more than any other player except due to injury, illness or lateness. Overthrows – If the defensive team throws the ball over the out of play lines, time will be called. Base runners will be awarded the base they are going to plus one at the time the ball went out of play. Defensive Interference – If in the opinion of the coach, a defensive player prevents a runner from reaching base safely, then the runner will be awarded the base they were prevented from reaching. A defensive coach may not touch a player when play is in progress. That is, they may not push, pull or otherwise physically direct a defensive player towards a ball after the offensive team has hit it. The ball is considered dead when this occurs. The team will also be warned and on a second infraction, that team will also no longer be allowed to position a coach in the outfield. You must still observe the no contact rule in regards to the players. Jr./Inter. A maximum of 2 coaches are permitted on the playing field behind the base line to assist the players until the first of June after this time no coaches are permitted on the playing field. You are to use the first half to teach the players the proper fielding positions. All players bat. If a player shows up late to a game he / she will be added to the bottom of the batting order. You cannot have the same batter bat last every inning except when you have 9 players or less. For Senior T-Ball batting line-ups are to be exchanged before each game with the designated score keepers. Batter’s Box – The batter must stay in the batter’s box while hitting the ball. The coach should ensure the batter is in the box before the ball is put in play. Thrown Bat – If any player throws the bat in an unsafe manner, a team warning will be issued on the first offense. All other incidences of a thrown bat will result in an “out”. The batter will be called “out”, and all base runners will return to the bases they occupied before the offense occurred. next hit ball will be in play regardless of the distance that the ball traveled. The coaches must ensure that both teams and the batter are aware that the next hit ball is in play. Junior and Intermediate players may take as many swings as necessary in order to put the ball into play. Play Ball – The home plate coach will place the batting tee on the plate, and call “play ball” in such a manner that all defensive players may hear. If the batter puts the ball in play before the coach has called “play ball” the hit is called dead. Batting Orders – The proper batting order must be followed in each inning. In the event a team bats out of order, it is up to the other team to notify the coaches after the batter reaches base and time is called. The proper batter is out, all base runners must return to the base they occupied before the infraction and the next batter is up. Lead Offs – All runners must keep one foot on the base until the ball is hit. If a lead off occurs the play is allowed to continue. When time is called, all outs made on the play will stand and all runners will return to the base they occupied before the infraction. The batter, if not out, will return to bat with the same count as before the lead off. If a lead off occurs on last batter, the play will continue and the runner(s) who lead off will not be allowed to score. Base Running Outs – The runner will be called out if a defensive player with control of the ball tags them. The tag must be made with the hand or glove containing the ball. The player is forced out; a defensive player with control of the ball touches the bag the runner must reach first. The runner runs drastically off the base path in an attempt to avoid being tagged. Junior and Intermediate players are never called out. Intermediate players can play with base running outs if the coaches of both teams agree before the start of the game. Hit By A Batted Ball – If a base runner is hit directly by a batted ball, and no fielding player has made an attempt on the ball, time will be called. The base runner will be out and all other base runners will be returned to the base they occupied before the infraction. Dead Hit – A ball hit without sufficient force to cross the dead ball line or hit such a way to disadvantage the infielders (such as half swings or chopping down the ball) is a dead ball. The coach will call a “dead ball”, if a dead ball is caught in the air by a fielder the batter is out. All runners will return to the base they occupied before the infraction. No bunting, chopping or half swings are allowed which place the defensive team at an unfair disadvantage. Base coaches may not touch a player when play is in progress. That is, they may not push, pull or otherwise physically direct an offensive player towards a base when play is active. The offensive team will be warned on the first infraction. On the second and subsequent infractions, the runner will be called out and play will continue its normal course (that is, the defensive team can attempt to get additional outs). Objective – The objective of the last batter is to hit and drive all remaining base runners home including themselves, before the defensive team can retrieve the ball, throw it to the catcher who steps on home plate stopping all further play. Announcing Last Batter -The offensive team must inform the other coach that the last batter is coming to the plate. The coach must announce last batter in such a way that all participants can hear. Failure to properly inform the defensive team of last batter status will result in a dead hit and the play will be done over. Legal Runners – If a base runner leads off on last batter, the play will continue but the runner that lead off will beconsidered an illegal runner and will not be counted in the score. If a fly ball is caught all base runners must tag up by touching the base they occupied when play ball was called. Any runner not tagging will be called illegal and will not count in the score. Encroachment – Any defensive player other than the catcher or the pitcher that crosses the encroachment lines before time is called on last batter, will be called for encroachment. If encroachment occurs, the play is allowed to continue until time is called. All legal runners will score. Stopping Play and Outs – Outs and play stoppage can only be completed by having the catcher control the ball and stepping on home plate. The pitcher may assist by backing up the catcher. If the pitcher gets the ball, he or she must pass it on by throwing or handing the ball to the catcher. No play or outs will be permitted on the base runners. Out of play – On last batter the out of play lines will remain in effect. If the ball goes out of play on last batter, time is called, and all legal runners (see 5.4) will score. If the ball goes out of play by rolling underneath the backstop, then time is called and all legal runners (see 5.4) will score, except the last batter. Defensive Interference – both coaches should review any defensive interference on the base runner. If, in their opinion, the runner would have scored in the absence of interference, then a run will be awarded.